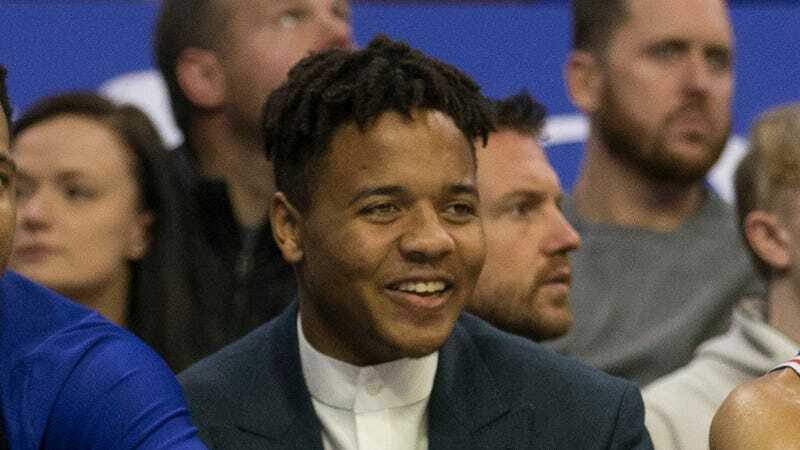 In his introductory press conference after being traded from the Philadelphia 76ers to the Orlando Magic, way back on February 7, Markelle Fultz announced that his rehabilitation from chronic shoulder crabmeatitis would continue indefinitely in sunny California. The Magic were cool with this plan, evidently prioritizing the long view of Fultz’s development over whatever short-term gains could be had by, uhh, rushing a guard with absolutely zero jump shot into their rotation. After spending the last few months rehabilitating in Southern California, the former No. 1 overall pick has relocated to Central Florida and will continue his rehab regimen in Orlando. Fultz is not practicing with the team and has no timetable for his return, but he will attend Magic practices and games. He said it felt “unbelievable” to be around his new teammates. Fultz has reportedly been joined in Orlando by Judy Seto, the physical therapist with whom he’d been rehabbing in California, and who is now “consulting with the Magic’s sports medicine staff.” He’s not expected to touch the court for the Magic this season, and assuming this rehabilitation process has him ready for opening night next season, he will have played 33 total games over his first two NBA seasons, a total of 680 minutes of burn. But if his shooting form is finally, finally functional, the wait will have been worth it for Magic fans and basketball fans generally. So how’s that jump-shot coming along? Fultz, 20, said he has been working toward being able to shoot without discomfort or pain. The Curse Of The 2017 Point Guard Class Is Coming For Dennis Smith Jr.